Sail your favorite frozen lake in comfort! 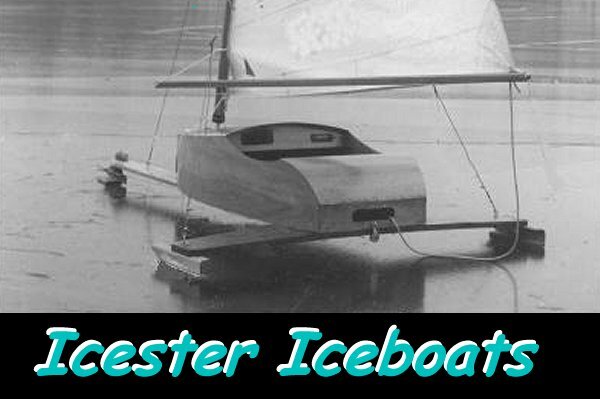 The Icester is an easily built, semi-enclosed, two seat iceboat. It is built from three sheets of 1/4 inch lauan or marine plywood, one sheet of 3/4 ply, and stock lumber for the springboard, mast, and framing lumber. Homemade or DN hardware (runners, steering, etc.) can be used. The advantage of the Icester design is that you sail more comfortably than in other, more open, iceboats. It's semi-enclosed design partially shields the pilot and passenger from the cold, and there is even room for an alcohol boat heater. It has a small trunk to store a blanket, lunch, ice-fishing gear, and so on. And yes, that is a radio you see in the dashboard! The Icester is not designed to be an all-out speed boat, but will nonetheless "top out" somewhere above fifty miles an hour. But you can stay out when the sailors of open boats have headed home to soak in a tub, and thaw their digits! You can explore your lake, stay warm while you check your fishing tip-ups, or go have lunch in a quiet cove. I am no longer offering Icester plans for sale. I'm busy working on other projects. On that list is (tentatively) another iceboat of a different design and concept... but that will not be for a couple of years at least. My research and writing are taking up much of my time. But if any builders of Icesters have any questions about the design, construction, or sailing, please feel free to write. And if you have any pictures of your boat, and would like them posted here, email them to me and I'll set up a page. "Ladies and gentleman, take my advice: Build an Icester, and slide on the ice!" You are visitor number to the Icester site.